Two young sisters share a moment of unguarded reflection and warmth. Wearing a serious expression, the older sister protectively holds her younger sister. She, in turn, leans into the older girl's encircling arms. 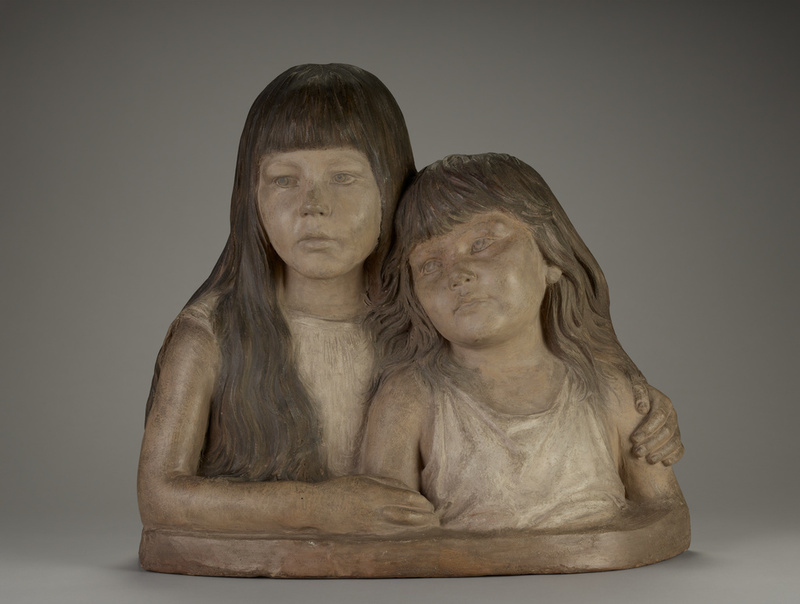 Modeled by sculptor Adolf von Hildebrand, who made his primary reputation producing official portraits, this terracotta is an intimate and sensitive double portrait of his daughters Silvia, age four, and Bertel, age three. Although he gave the faces the most detail, Hildebrand also included much of the torsos in the bust to express physically the sisters' affectionate relationship. Using a format derived from Florentine busts of the 1400s, he terminated their torsos with a strong horizontal line and included a low plinth on which the older girl rests her arm. Like the earlier Italian busts, this one was painted with colored pigments. Early Renaissance art was particularly influential for Hildebrand, who divided his time between working in Munich and Florence. Heilmeyer, Alexander. Adolf Hildebrand (Bielefeld and Leipzig: Verlag von Velhagen & Klasing, 1902), pp. 44, 66, ill.
Heilmeyer, Alexander. Adolf von Hildebrand (Munich: Verlag von Albert Langen, 1922), pp. 29, 47, fig. 10 (top). Hass, Angela. Adolf von Hildebrand: das plastische Portrait (Munich: Prestel-Verlag, 1984), p. 109, ill.
Arnoldi-Livie, Munich. 70 Zeichnungen und Bilder 1590 1913. Summer 1986, pp. 80-81, lot 67, ill.
Esche-Braunfels, Sigrid. Adolf von Hildebrand (Berlin: Deutscher Verlag Fu¨r Kunstwissenschaft, 1993), pp. 431, 435, fig. 714. Fusco, Peter. 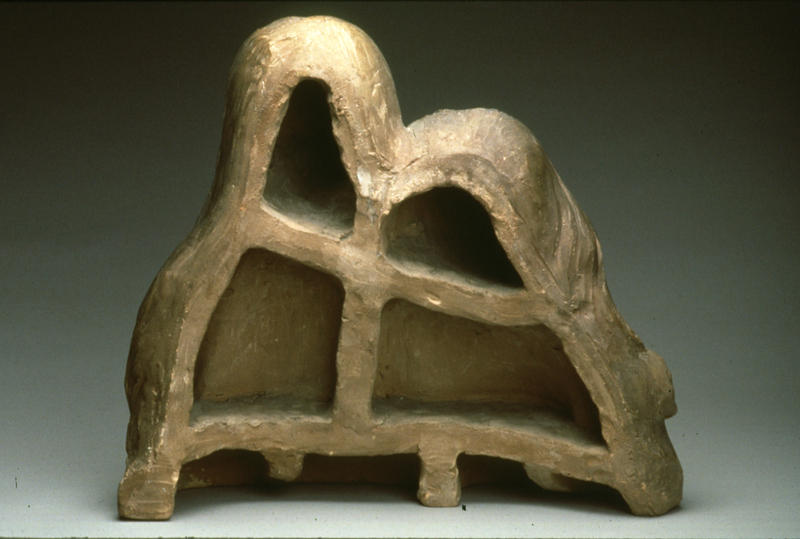 Summary Catalogue of European Sculpture in the J. Paul Getty Museum (Los Angeles: J. Paul Getty Museum, 1997), p. 29, ill.
Fusco, Peter, Peggy Anne Fogelman, and Marietta Cambareri. Masterpieces of the J. Paul Getty Museum: European Sculpture (Los Angeles: J. Paul Getty Museum, 1998), pp. 122-23, no. 45, ill., entry by Peggy Anne Fogelman.